Deeping Rangers (claret) in action at Peterborough Sports. Photo: David Lowndes. Netherton United, a team with aspirations of joining the United Counties League, can test themselves against one of the best tonight (January 17). The Peterborough Premier Division leaders travel to Deeping Rangers for a Hinchingbrooke Cup quarter-final. Deeping are third in the UCL Premier Division and will be warm favourites to progress to a semi-final meeting with Wisbech St Mary. Netherton centre-back Ben Daly (red) in action during a weekend win over Peterborough Sports Reserves. Photo: David Lowndes. Deeping lost for the first time in 22 top-flight matches in a big game at Peterborough Sports at the weekend (January 14). Yaxley seek to reach the semi-finals of the United Counties League Cup when hosting Premier Division rivals Oadby at In2itive Park tonight. 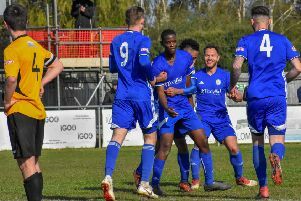 The Cuckoos will fancy their chances of earning a semi-final date against Division One high fliers Olney who beat Holbeach United on Saturday. Wisbech Town’s scheduled Premier Division match against Sleaford Town at the Fenland Stadium tonight has been postponed because of an unfit pitch. Holbeach United play their delayed Lincs Senior Trophy quarter-final at fellow UCL Premier Division side Boston Town tomorrow (January 18). The Tigers have lost their last four matches. The winners travel to Deeping Rangers in the semi-final. Deeping Rangers v Netherton United. Boston Town v Holbeach United.